"The ElliptiGO 11R is a high-performance, fun racing machine that I can take up any incline I feel like tackling that day. Injuries forced me to retire from professional running, but nothing holds me back on this device - it's everything I could ask for." Patricia K.I reviewed my 11R years ago and now have between 10,000 and 11,000 miles on it. It's still a joy to own and ride, and I love being outside, high above the ground, feeling like I'm flying, while getting such a great muscle building workout. I've put about four new chains on it and five rear tires, and three front tires. Normal maintenance items for that mileage have been performed. My 11R is bullet proof. I LOVE this exercise machine! John B.Long story short, I was a runner and enjoyed biking for a good number of years. Finally had my left knee replaced when I couldn't take a step without wincing. Dr. Said no more running and I found my range of motion less than what it used to be, even after rehab. I used an elliptical at the gym for a couple years but really missed being outside. Someone at a neighborhood party told me about Elliptigo. Bought the 11R on line and couldn't be happier. It is very easy on my knee and so much fun to ride. A 20 mile jaunt is a great aerobic workout and can be done easily in about an hour. My road bike sits in the garage because the Elliptigo is so much more fun to ride. Larry W.If you want to keep a level of fitness once enjoyed in your younger years, without pounding your knees, back and hips, this piece of gear is hands down the beast of beasts to make it happen all over again. When it comes to emulating the best of both worlds in running and cycling combined, the 11R will blow your mind in functionality and durability. Easy to master, fun to ride, I give it five stars. Good job ElliptiGo Team..... Semper Fi! Ted R.I am an avid cyclist who rides a high end carbon fiber road bike 3,000 miles a year. The 11R Go has been a great cross trainer to mix up my exercise routine and consistently puts a big smile on my face. I also like the flexibility of hooking up the Go to my indoor trainer and riding on cold winter days. The Service department at ElliptiGo has been great to work with. They showed me how to hook up my Garmin Edge bike computer to the 11R so I could have the same information that I utilize on my road bike. The quality of the Go has exceeded my expectations! Mike D.As a distance runner with recurring knee problems, I have been frustrated that I can't replicate the "runner's high" except by running. The ElliptiGO has become my solution. I had tried everything (biking, indoor elliptical, treadmills etc) and nothing came close. 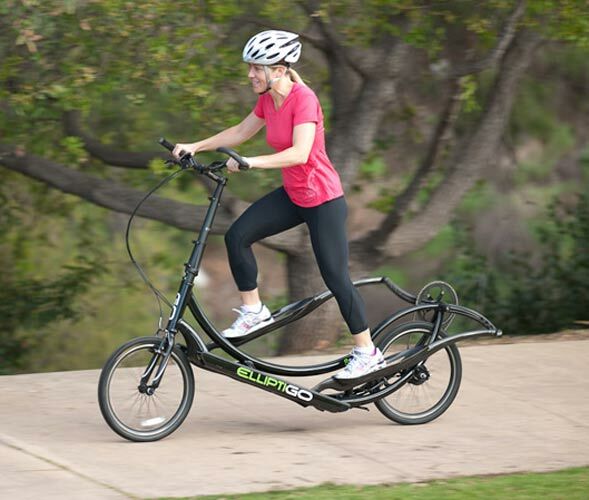 With the ElliptiGO, I now experience the runner's high AND avoid the pounding on my knees. The ElliptiGO delivers on the promise of "running without impact". I am committed! Chris B.I have been a physical education teacher for 25 years and grew up playing every sport that came my way. I love sports and staying fit. The Elliptigo bikes are absolutely the best and healthiest new products to enter the sports world. I would rate them a 6 on the 1-5 scale. I still love to run, play basketball, and pole vault, and riding the Elliptigo has kept me in top fitness condition while keeping my legs totally injury free. After 16 hours of climbing just under 20,000 feet, my legs felt great and I could have done anything the next day. These bikes are headed for the Olympic games in the future. Ken v.I was in the first group of four to have run a marathon on all seven continents of the world and got through that without sustaining any serious joint injuries. However, this past year my back went and so did the ability to run. Your Elliptigo was a Godsend! I am out on it every day possible with no wear and tear or beating on my back. I have an 8-speed here in Florida and have just purchased your new 11-speed for my home in Maine where we have many hills. Patricia K.I've been riding my 11R for 33 miles, three times a week with an elevation change of about 1,000 ft. I really enjoy the extra high gears of the 11R on the descents. It's easier for me to fold down the handlebars when I put the ElliptiGO inside my Crosstour, than it was to remove them on my previous green 8C. The black color makes it a classy machine. I'm not a competitor but I like to have high quality exercise equipment for my workout. This 11R is a delight! John P.I actually was a bit unsure of the need for the 11r (the extra gears), given the fact that there is a point of diminishing return because of the wind resistance created by the upright riding position. Whether you are a World Climbing Championship competitor, or someone who wants to compete with the road cyclists, or simply want to take advantage of an amazing ride that will improve your fitness, the 11r is the GO you need. Elliptigo got it right with the 11r.